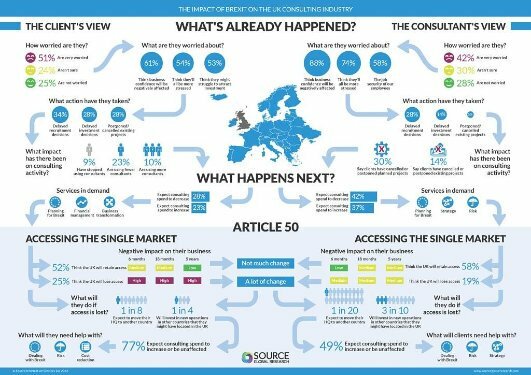 By way of further update on my recent post I recommend an interesting article and excellent infographic by Source Global Research. You can see the infographic but for the full article you need to register HERE and download it for free. Headquartered in the UK they are the leading provider of information and surveys on the UK (and indeed global) consulting market. They surveyed 79 “clients” (the assumption is these are purchasers of consulting services but unfortunately I couldn’t see this stated) and 44 Partner level consultants, or equivalent, in July 2016. There were general questions as well as more specific ones about use of consultants and consulting recruitment. However on a more positive note for the industry 77% of clients expect consulting spend to increase or be unaffected. Indeed it is not difficult to see consultancy opportunities in the medium term that will dwarf Y2K. My belief is there will be two tipping points. Firstly the next 2-3 months will make it clear whether the UK is moving into a recession or not with an obvious short term impact on consultant recruitment. The second will come in time as the shape of the deal becomes clear and investment and other decisions can be made by consultants’ clients which will have a big effect (probably for the better but not necessarily) on consulting firms’ fortunes and consultant recruitment.